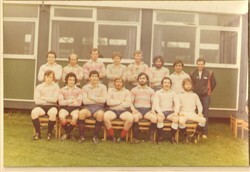 (2)(Top left) Ist XV team photo in rugby kit, in front of Portakabin. Two rows: E Dix, A Smith, P Clift, S Carr, R Taylor, P Dell, K Burnett, P Allman, I Cox, D Crafter, A Mynard, M Butterfield, S Parkin (capt), M Mynard, G Hammond, M Wilkinson. 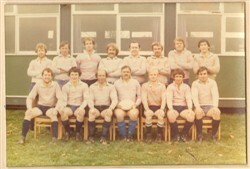 (3)(Top right) A XV team photo in rugby kit, in front of Portakabin. Two rows: B King, A Howkins, A Costain, S Bebbington, A Collett, R Faulkener, G Sparrow, Amills, P John, D Crafter, F Williams, C Talbot (capt), C Main, G Hammond, A Williams. 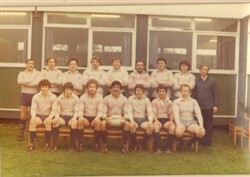 (4)(Bottom left) B XV team hoto in rugby kit, in front of Portakabin. Two rows: S Rooks, F Williams, S Costain, unknown, R Soman, P Shaverain, A Williams, D Smail, K Chennels, G Ingram, A Mills (capt), R Faulkener, N Hall, J Ingram, D Harries. 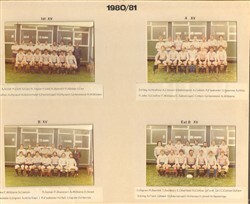 (5)(Bottom right) Ext B XV team photo in rugby kit, in front of Portakabin. Two rows: G Ingram, R Barrick, T Salisbury, E Chatfield, D Clifton, J Ford (Dr), C Cotton, D Kerr, B King, A Field, J Brock, D Adams (capt, M Vernon, K Smail, W Sawbridge.